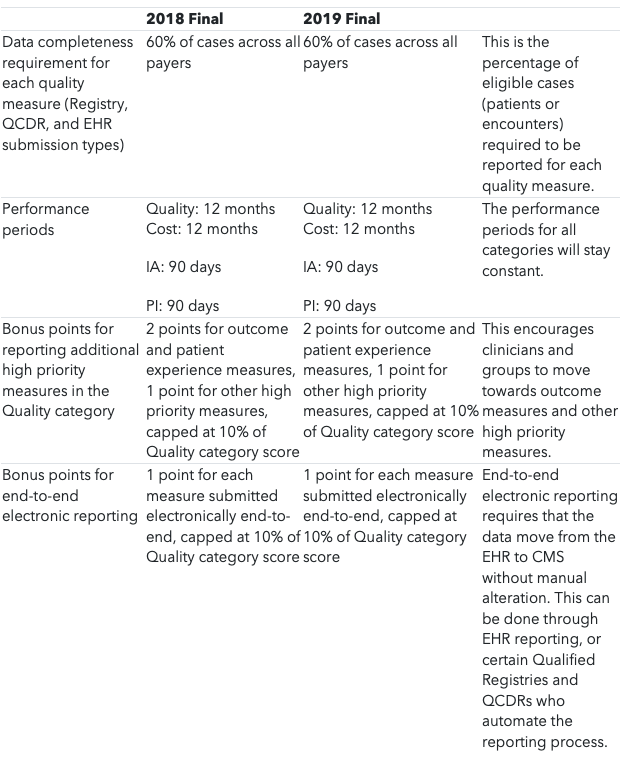 The final rule for the 2019 Quality Payment Program (QPP) was released on November 1st, 2018, and provides clarity on what the changing and expanding program will look like next year. 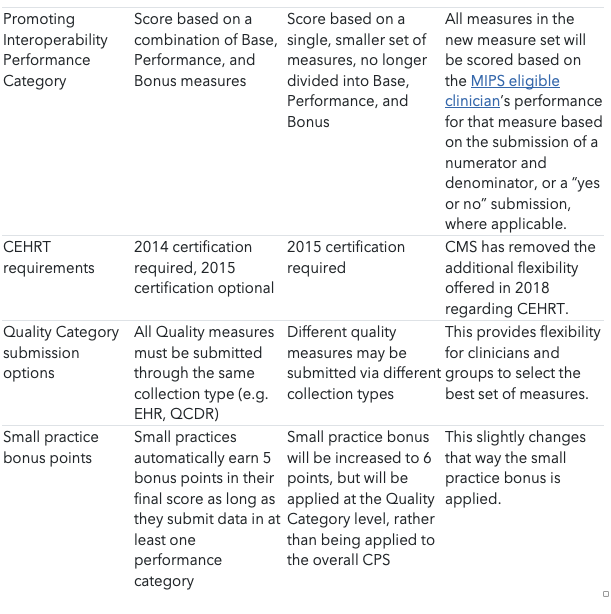 As the program ramps up, the number of providers affected is also expanding: CMS has estimated that approximately 798,000 clinicians will be MIPS eligible clinicians in the 2019 MIPS performance period, an increase of almost 148,000 from the estimate they provided in the 2019 proposed rule. 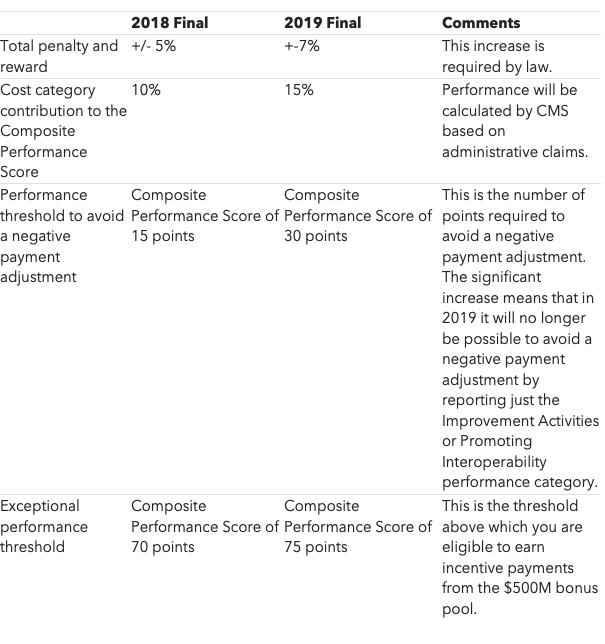 Here we will outline some of the key changes, and provide a comparison between 2018 MIPS and the 2019 final rules. The Performance Threshold required to avoid a negative payment adjustment will double from 15 points to 30 points in 2019. This means that it will no longer be sufficient to only report Improvement Activities or Promoting Interoperability, which was a popular strategy to meet the performance threshold in 2017 and 2018. The Exceptional Performance Threshold is increasing from 70 to 75 points in 2019, meaning that a higher score is required to earn an additional bonus from the 500M bonus pool. Additional clinician types are being added to the list of eligible clinicians. New clinician types are: physical therapists, occupational therapists, speech-language pathologists, audiologists, clinical psychologists, and registered dietitians or nutrition professionals. The Cost category is increasing from 10% of the Composite Performance Score (CPS) to 15% of the CPS, and new episode-based measures are being added. The Quality category is decreasing from 50% to 45%. and measures with scoring based on measure performance. Eligible clinicians and groups will now be able to submit Quality data through multiple submission types (“submission type” is the new official term for “submission mechanism,” or the method you use to submit data to CMS.) For example, a group or clinician may submit some measures through an EHR and some through a QCDR, and the measures will be scored together as part of one set. 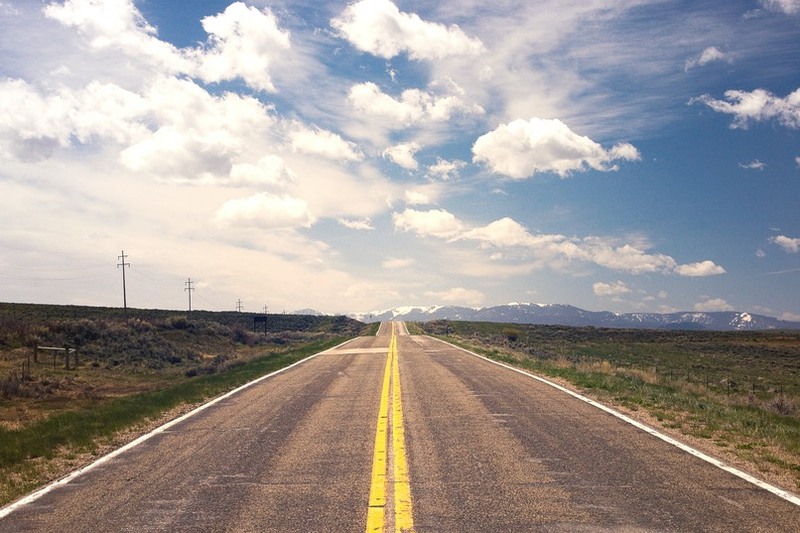 Which key requirements are changing in 2019? Which key requirements are staying the same? Our clients produce top-tier MIPS scores fueled by our proven methodology and cloud-based dashboards. Click below to send an email request for a FREE consultation. We will respond with an email to get you scheduled quickly. We look forward to hearing from you.